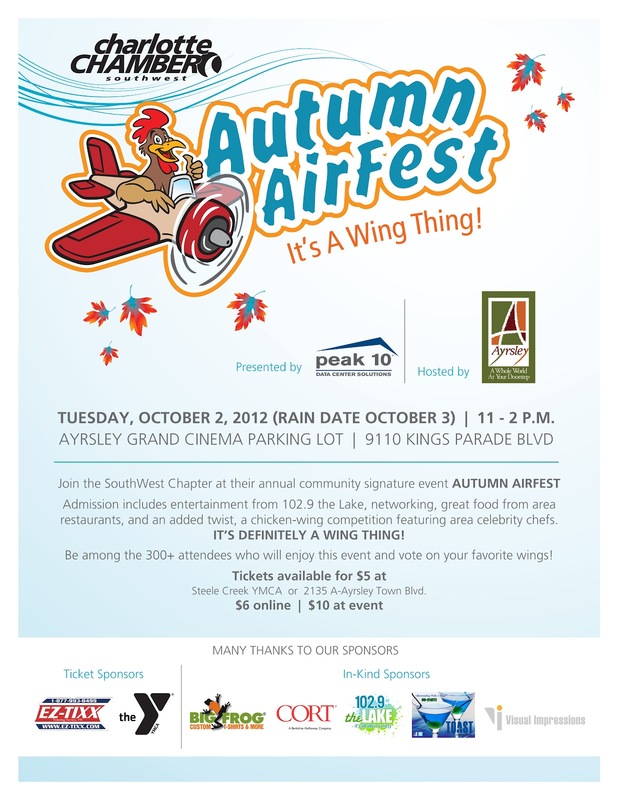 UPDATE: Autumn AirFest has been rescheduled to this Wednesday, October 3 due to rain forecast for Tuesday. The Charlotte Chamber's SouthWest Chapter is presenting its annual Autumn AirFest event on Tuesday, October 2 Wednesday, October 3, 11 a.m.-2 p.m. at Ayrsley Town Center, 9110 Kings Parade Blvd. You should break away from work and enjoy the entertainment by 102.9 The Lake, networking, sponsor giveaways, games, prizes, and food from area restaurants. There will also be a chicken-wing competition by chefs from Nana's Soul Food, DD Peckers' Wing Shack, Mac's Speed Shop, Wild Wing Cafe, and Fuel Pizza. And I have the honor of serving as one of the judges. I'll be prepared for somebody to point out that I pronounce wings like "wangs"—hey, I was born and raised in South Carolina. You can purchase tickets for $6 in advance by clicking here; or pay $10 at the event. Follow the tweets at #CLTAirfest.